The Windham Regional Career Center (WRCC) and Brattleboro School of Dance work together to create and run the WRCC Performing Arts/Dance program. This intensive dance program is offered to public high school students from Brattleboro Union High School, Twin Valley, Leland and Gray Union High School, Bellows Falls High School, Austine School for the Deaf, and Hinsdale High School. Home Study students in local Vermont districts may also qualify for enrollment in this program. If you or a student you know is interested in participating in the WRCC program, please contact Anne Doran at 802-451-3900 ext. 3586 or by email at adoran @ wsesu.org for more information. Students in the WRCC program are exposed to many different types of dance including ballet, modern, jazz, and salsa. 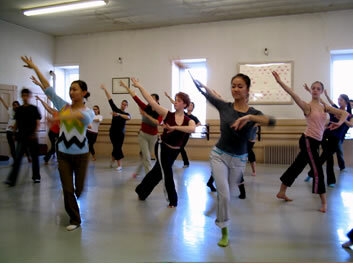 They also are exposed to master classes – for example, a lesson in a traditional Chinese dance, pictured at right. National High School Dance Festival Every year or so, the WRCC Dance Program travels to the National High School Dance Festival in March. In the past, they have traveled to cities such as Baltimore, Miami, and Philadelphia. For information on this year’s festival please visit the NHSDF website.